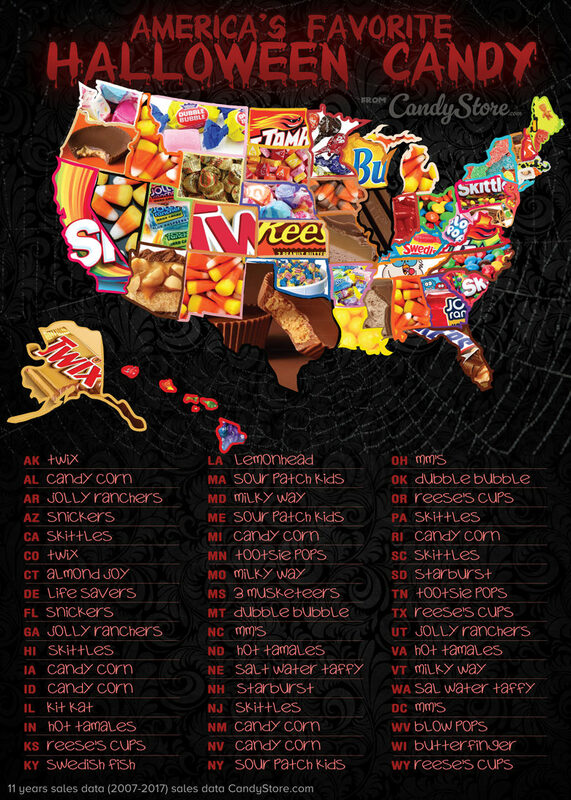 Interactive Map: Which Halloween Candy Is Most Popular In Your State? Does your favorite choice of candy reflect where you live? Believe it not, there are studies that measure the popularity of Halloween candies in each state. CandyStore.com looked at their sales data from 2007-2017 and partnered with major candy manufacturers to confirm their conclusions. Overall, Skittles, M&Ms, Snickers, Reese’s Cups, Starburst, Candy Corn, Hot Tamales, Hershey’s, Tootsie Pops and Jolly Ranchers topped “America’s Top 10 Halloween Candy” list respectively, but the three states who consumed Skittles, for example, the most, were California, South Carolina and Pennsylvania. Play with the interactive map above and check out the top candy list below to see where your state ranks!